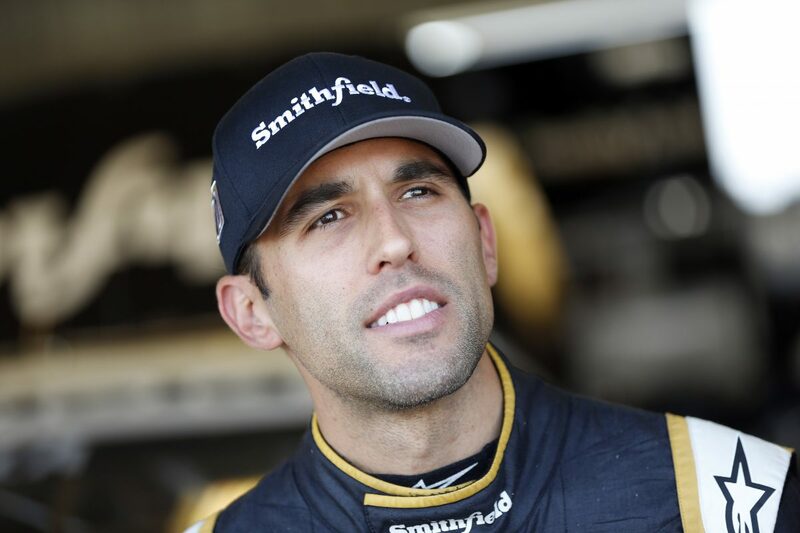 Aric Almirola started Stage 1 in the 12th position at Kentucky Speedway in Sparta and completed it in the ninth spot to earn two bonus points. On lap 39 Almirola made a scheduled green-flag pit stop from the ninth spot for fuel, four tires and an air pressure adjustment to help with his loose-handling Smithfield Ford Fusion. After pit stops cycled through, Almirola was in the 10th position and reported on lap 66 that he was still looking for rear grip. In the closing laps of the stage he maneuvered his way into the ninth position. Before the start of Stage 2 Almirola visited pit road for four tires, fuel and an air pressure adjustment. With varying pit strategies, Almirola started Stage 2 in the 14th spot. By lap 108, the Tampa native worked his way up to the 12th position. When the first unscheduled caution of the race came out on lap 109, crew chief John Klausmeier made the call for two right-side tires and fuel. Almirola restarted in the seventh position on lap 114. The remainder of Stage 2 was under the green flag, and Almirola ended the stage 11th in the No. 10 Ford. Before the start of the last stage, Almirola came down pit road for four tires, fuel and adjustments. He began the final stage in the 11th position. Shortly after the restart as he ran 12th, Almirola reported his No. 10 machine was lacking rear lateral grip. The 34-year-old remained in the 12th spot until the fourth caution of the race came out on lap 207. Almirola once again visited pit road for service and restarted 12th on lap 214. As the laps continued to click off caution-free, Almirola worked his way up to the eighth position, where he ultimately finished. This was Almirola’s eighth top-10 finish of 2018. Almirola earned his first top-10 in six career Monster Energy NASCAR Cup Series starts at Kentucky. Almirola finished ninth in Stage 1 to earn two bonus points. Martin Truex Jr. won the Kentucky 400 to score his 19th career Cup Series victory, his fourth of the season and his second at Kentucky. His margin of victory over second-place Ryan Blaney was 1.901 seconds. There were four caution periods for a total of 22 laps. Only 21 of the 39 drivers in the Kentucky 400 finished on the lead lap.